Jes MaHarry in her studio. To commemorate the anniversary, we will be posting several blog posts featuring some of our favorite artists. This week, we are featuring artisan Jes MaHarry. 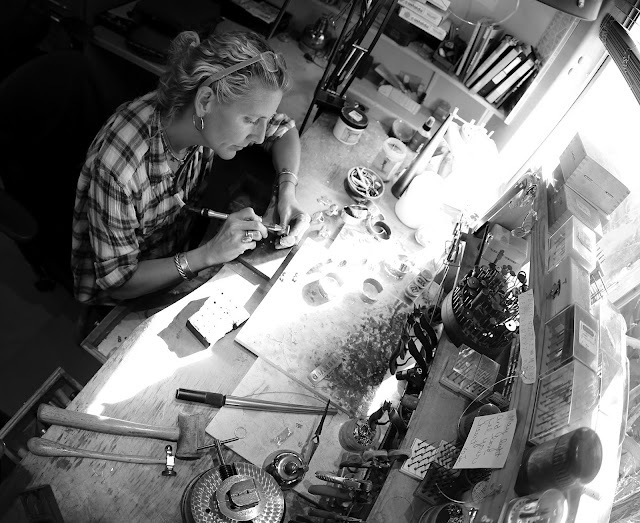 Jes designs her jewelry with the hope that it will bring a bit a beauty to the world, and a measure of solace and peace. 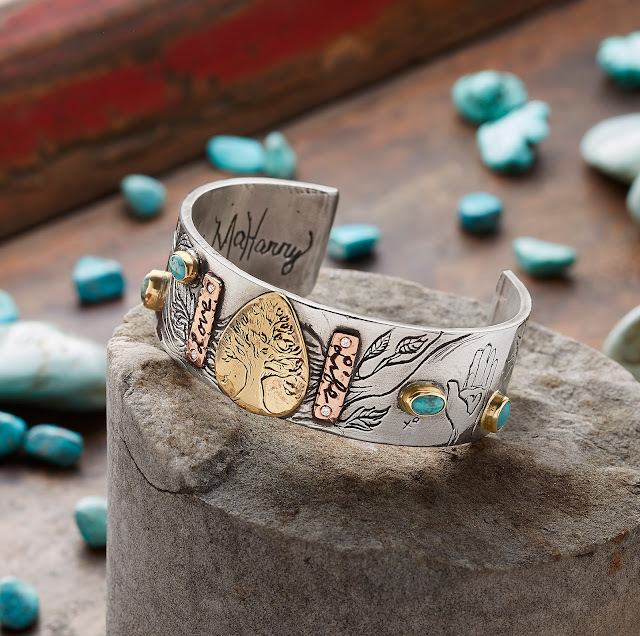 Jes tries to represent the wonder of the natural and spiritual worlds through her work and hopes her pieces resonate deep within all who wear them. Sundance: How did you get started as an artist? how to work with metal in the way I wanted. I had taken a few goldsmithing classes, which was really amazing... as I was able to learn even more. My love for drawing merged with metal over 25 years ago. I can remember the exact moment when I started drawing into metal. My true calling was answered, and from that point on I have honed my craft to be very unique. 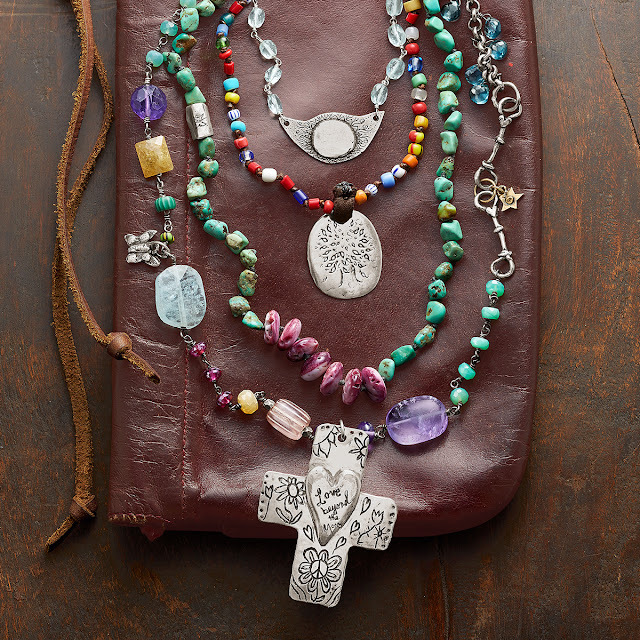 My favorite stones are beautiful hand-cut and aged to perfection antique pieces of rare authentic turquoise. I do love diamonds, although they are not rare, I love the magic they add to a piece. I also love tourmaline and authentic glass trade beads that are hundreds of years old. I am in love with beautiful high-quality gems I can find. I pride myself in only using the best and ethically-sourced stones around the world. My inspiration comes from love... love for my family, the wilderness and animals, particularly from my rescued animals. SD: Can you tell us a little more about yourself? JM: I love the untouched wilderness, running in the mountains, hiking, being with my horses, swimming and cultivating inspiration through art - painting and drawing, organic gardening and yoga. Of course, being with my family is my first love, and most of all, I enjoy being in the outdoors with them. I live on a ranch with my husband Patrick Henderson who is also a metal-smith. We have three children. I have built a life I love that revolves from my free spirit. We have also built our ranch and filled it with organic gardens and pastures with our rescued animals. We contribute to many non profits and are active and conscious environmentalists.